where is this Slappy Cakes…and do they deliver (lol)? Returning the love! Photos look amazing! The bacon looks like heaven! 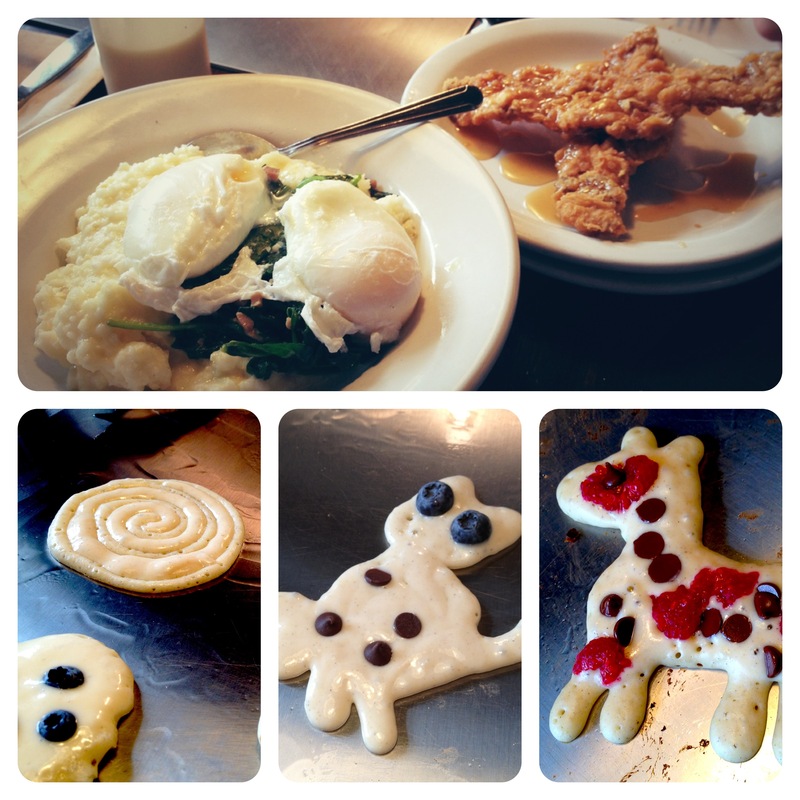 You’re pancake animals come out so much better than mine! looks yummy! check out my blog!! Matt, wordpress suggested that I follow and become friends with you. Love your photos of food but as I write humor. Crap….are they trying to set us up on a date? I mean I am married and you might be. I would hate that wordpress is trying to advocate affairs. That would be naughty. No, I am kidding. Yes they recommended you to me but you’re the only one. I am not sure why. Anyway, great blog. Check mine out sometime. I write humor/satire, if you don’t offend easy. They recommended you to me, too… I can’t wait to read why! Never heard of chicken fried bacon before. I love humor and satire…would love to check out your blog :). I don’t see your blog Vijaya link? Chicken-fried bacon?! Holy sh*t! Life just keeps getting better. Your batter shapes are quite clever but why so prudent with the chocolate chips? As Rebecca, I too, was suggested to follow you… Anyway, those photos make me huuunngrry Cool photos. I especially like the kitty-shaped one. I saw a kitty there! You ate her, too? I’m sure you don’t need a surrogate mother, but I don’t think chicken fried bacon is what the doctor ordered. You may be young now but your arteries will thank you if you limit these indulgences to once in a blue-violet moon. Deep-fried bacon! Lord have mercy! And I thought Burger King’s Bacon Sundae was crazy. Matt, you seem to be “Da Man”…or at least “Da Friend”. WordPress suggested I friend you as well. As for my blog, I write short (mostly) non-fiction. My goal is simply to write. I’ve denied the siren call for too long (decades). It’s time. I used an iPhone application called Diptic. Thanks! Will try but my photos are mostly taken by my DSLR not iPhone…. Matt, I have never heard of “Chicken Fried Bacon”. Looks good!